Questions: How to subscribe to a new tag? What is the meaning of "Watch tag"? 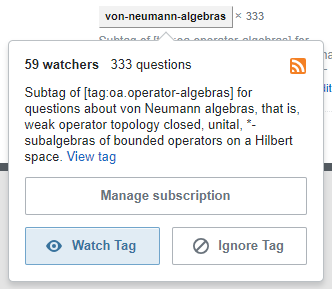 As far as I can tell, the difference between subscriptions and tag-watching is that the former provides you with possibility to get updates about content via email and the latter changes the way you interact with the questions having these tags directly on the site. How to subscribe to a new tag? What is the meaning of "Watch tag"? As pointed out in this answer, there used to be choice to subscribe/unsubscribe on the tag pop-up before this change. The same thing was mentioned in this recent question: How to subscribe to tags? Some basic information about tag-watching can be found here: What do “favorite tags” and “ignored tags” do? Not the answer you're looking for? 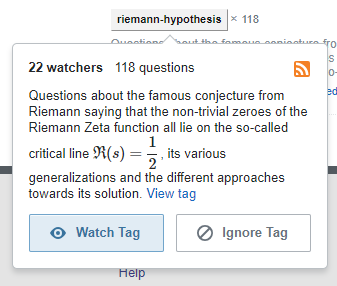 Browse other questions tagged support tags favorites .